The Faculty of Medicine Vajira Hospital is a famous Medical School located in Bangkok, Thailand. The Faculty started as a Medical College previously know as Bangkok Metropolitan Administration Medical College & Vajira Hospital , the Medical School had its roots in the founding of Vajira Hospital in 1912 and was officially established in 1993. Since 2010 it became a founding faculty of the newly established University of Bangkok Metropolis. Primary healthcare only became available in Siam in the late 19th century. But the number of Hospitals was still insufficient to meet the public demand. In effort of resolving this insufficiency Vajira Hospital was founded in 1912 by H.M. the King Vajiravudh, Intended to provide efficient public healthcare for Bangkok. It is one of the oldest Hospitals in Thailand, located on Samsen road in Dusit District, Bangkok. The Hospital name “Vajira” was named by the King Vajiravudh. Bangkok Metropolitan Administration (abbreviated as BMA) Medical College was opened in 1985, operated by the BMA, originally as a clinical training center receiving medical students from the Faculty of Medicine Srinakharinwirot University. Even though as a separate organization the BMA Medical College headquarters in Vajira Hospital and provides teaching here. Subsequently in responding to a growing insufficiency of number of medical doctors, in 1993 BMA Medical College started their own medical program and opened admission for students, as an affiliated institution of Mahidol University. Students attend their pre-clinical trainings at Mahidol University. In 1998 BMA Medical College was merged with Vajira Hospital into a single organization under the name BMA Medical College & Vajira Hospital. In 2010 BMA Medical College & Vajira Hospital along with Kuakarun College of Nursing joined to form a new University named “University of Bangkok Metropolis” with the medical school’s name changed to Faculty of Medicine Vajira Hospital, University of Bangkok Metropolis. It has been officially declared in the Royal Thai Government Gazette in November 12, 2010. 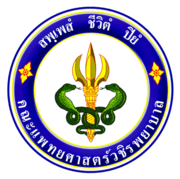 On June 3, 2011 H.M. the King Bhumibol Adulyadej has presented the university with a new formal name as “Navamindradhiraj University” but is still in the process of official declaration. Vajira Hospital provides medical education for both Medical students and Postgraduate medical students. Vajira accepts about 80 students a year graduated from secondary schools. Medical Students receive their Pre-clinical studies at Mahidol University with the first year at its main campus at Salaya. The first year the students will study basic general studies which includes subjects such as Biology Chemistry Calculus Statistics Physics and many others. Students spend their second and third years at the Faculty of Science, Mahidol University in Mahidol University’s Phayathai Campus, studying basic medicine. The Clinical training, starting in the second semester of the 3rd year, is provided at the Faculty’s campus at Vajira Hospital. Vajira is one of the country’s leading school in terms of medical science, clinical training and urban medication. Medical doctors graduated from Vajira are not only highly qualified and well trained but also ethical and moral. Students are well trained in areas of public service, teaching as well as research. I trust you will consider my qualification and experience.